Mr. Brown: Diamond, the only trouble with you is, you'd like to be me. You'd like to have my organization, my influence, my fix. You can't, it's impossible. You think it's money. It's not. It's personality. You haven't got it. You're a cop. Slow. Steady. Intelligent. With a bad temper and a gun under your arm. With a big yen for a girl you can't have. First is first and second is nobody. Q: How did Mingo injure his hand? This is one of the finest of film noirs, unjustly forgotten. John Alton's black-and-white cinematography is brilliant, smoothly playing with light and darkness while dazzling our eyes. This might be Joseph Lewis' best film (it's a hard choice) and the cast is amazing. 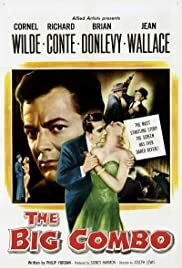 Fun to see Lee Van Cleef and Earl Holliman play (probably) gay hit men; Brian Donlevy in an unusual supporting role provides heft; Richard Conte is a great, great villain. And Jean Wallace is luminous in the femme-fatale-turned-good role. Catch it if you can.